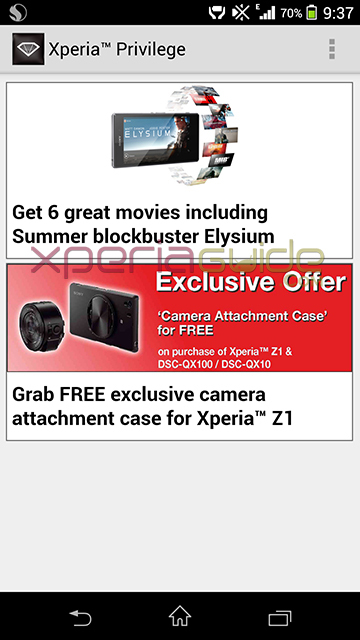 Sony Mobile has started a promotional campaign where you can download 6 movies free from Xperia Privilege Movies app including summer blockbuster Elysium. 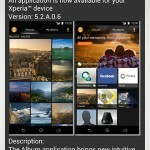 Xperia Privilege is an app made specially for Sony Xperia smartphone users which includes promotional campaigns, varying from region to region. 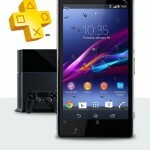 This time you can download some great movies if you are the proud owner of Sony Xperia Z1, Z Ultra and Tablet Z. In past we have seen Sony giving special free £20/€25 Voucher to Xperia Z users in certain regions which was to be redeemed on “Play Memories online, Music Unlimited, Play Now, PlayStation store” etc. 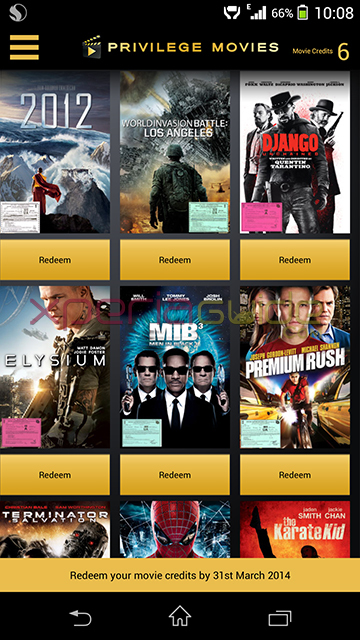 You can now download 6 free movies from 10 listed movies and each user is given a unique code to redeem 6 credits. 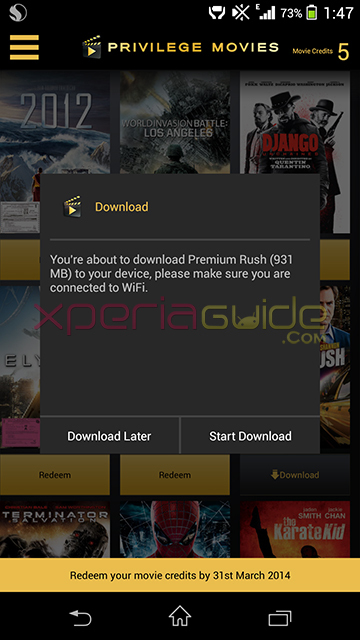 TOS :- The above offer of downloading free movies is valid for only Xperia Z1, Z Ultra and Tablet Z owners in regions India, Mexico, Brazil, UAE, Russia, Poland, Indonesia, Malaysia, Sweden, Saudi Arabia, Hong Kong, Taiwan, Netherlands, Singapore, Thailand and South Africa. Movies included :- 2012, Elysium, MIB 3, Premium Rush, DJango, Battle: Los Angeles, Terminator 4, The Karate Kid, The Amazing Spider Man, Total Recall. Promotion Period :- 1 November 2013 to 31 December 2013 and voucher can be redeemed till 31 March 2014. Now look for the promotional offer in the app as shown below. After choosing promotional offer “Get 6 great movies including Summer Blockbuster Elysium” you will be shown the promotional campaign details. Accept the TOS of the campaign. 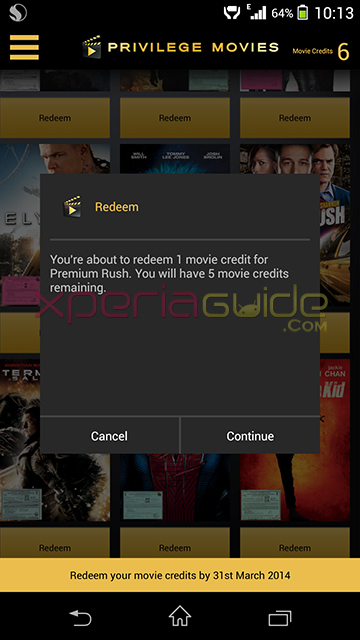 As you enter the campaign you will be given your unique voucher code which is to be entered in Xperia Privilege Movies app. 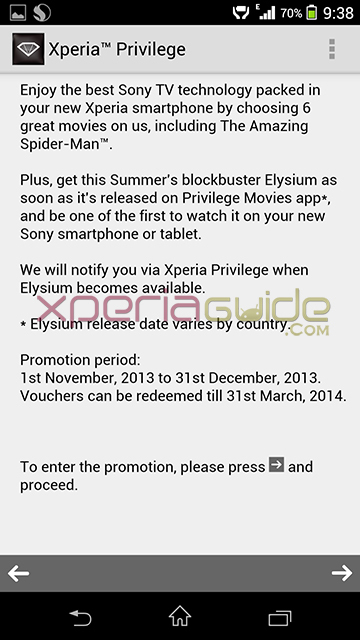 After downloading the Xperia Privilege Movies app, open it and sign up entering your email id and voucher code. You will be see the list of all 10 movies listed for download, tap on redeem button to download the movie. 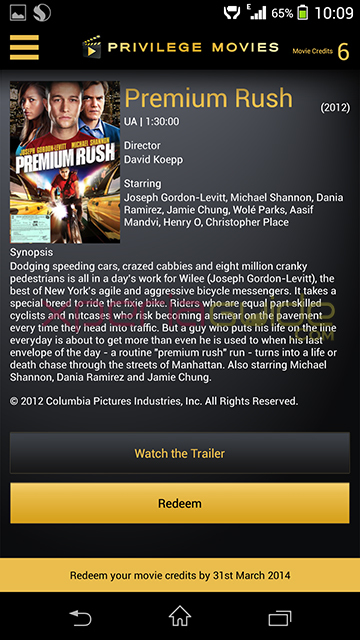 Movie can only be downloaded over Wi-Fi and it will be played by the movie player of app itself. 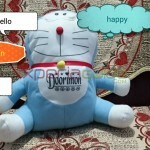 Each user can use the voucher code only once. 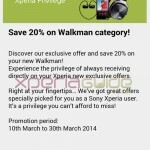 Other Xperia users may not be able to avail this offer but you are able to do so in any manner do let us know in below comments. If you have avail this offer, let us know about your views on it, you like it ? I am from the netherlands andere also got the voucher, only elysium is not yet listes. 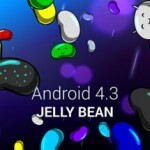 Have to wait for a While. It depends on the release of a particular movie in a certain region. 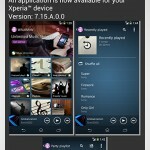 Is there a possibility of watching these downloaded movies outside of this App? Cannot find this content anywhere in mobile storage, wanted to play this in my TV or laptop. no you can’t, only the movie player of xperia privilege app can play them.